How do we display data in a way that is meaningful? This is the question that has been posed by Dr Robin Carhart-Harris from the Division of Brain Sciences at Imperial College London, the lead researcher on the recent clinical trials into the effects of psilocybin/psychedelics on the brain. Between 2012 and 2016, Dr Carhart-Harris’ team have conducted different studies using psilocybin (the hallucinogenic compound found in magic mushrooms) and LSD aimed at understanding the impact of potent hallucinogenic drugs on the human brain. The results have provided first evidence of the underlying changes in brain function that are associated with the well-documented drug effects and have laid the foundation for future studies to evaluate potential medical treatments for conditions such as depression, end-of-life anxiety and addiction. “Normally our brain consists of independent networks that perform separate specialised functions, such as vision, movement and hearing – as well as more complex things like attention. However, under LSD the separateness of these networks breaks down and instead you see a more integrated or unified brain. Our results suggest that this effect underlies the profound altered state of consciousness that people often describe during an LSD experience. It is also related to what people sometimes call ‘ego-dissolution’, which means the normal sense of self is broken down and replaced by a sense of reconnection with themselves, others and the natural world” (McCartney 2016). 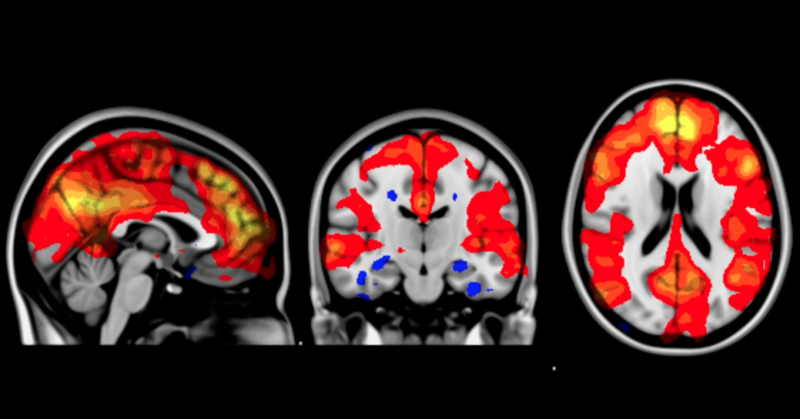 The result of the study is a wealth of fMRI and MEG data that when analyzed will give a fascinating insight into the brain’s ability to define the self. However, to access someone’s state of consciousness with the current research methods remains a challenge due to the ephemeral and subjective nature of the subject matter. The Imperial team are interested in the neural correlates of ego dissolution, i.e. the disintegration of the boundary between the self and the world, an effect typically associated with psychedelics. ‘The output of our brain imaging work is often a static image and really that is not conveying the reality of how these drugs are changing the brain because biological systems aren’t static, they are characteristically dynamic. They change and are always moving. And so one of the challenges is to try and find a way of displaying our data that is truer to that dynamic reality’ (Carhart-Harris 2016, pers. comm.). One way the team at Imperial College are engaging with this challenge is to step outside of the lab and attempt to turn the data into something other than a number. The MEG data are time-series consisting of a mixture of sine waves. As with all neural data, it contains noise and the challenge is to accurately extract the signal. SINES Collective – an organisation that curates interdisciplinary projects with art, neuroscience and technology- are taking the data and attempting to sort the signal from the noise by drawing on another field of expertise that is familiar with sine waves, music. In a two day event, teams of sound artists, neuroscientists and data analysts are set to explore the data sonically, working with an understanding of the neuroscientific context and implications of the creative interpretations. Is this approach going to provide a method to translate the data into a form that rigorously represents the nature it describes? Probably not. But maybe it will give the collaborators an insight into another perspective that will allow them to interpret the data in a different way. But if that is the case then so what? Is there any point to such an endeavour other than a great opportunity for different types of navel gazers to nerd out together? The data is to all intensive purposes a transliteration of the biological activity in the brain that was in the MEG scanner. And the brain that was in the MEG scanner was in a person who was experiencing a chemically induced collapse of their perception of the boundary between themselves and the rest of the world. The knowledge that is produced is always going to be a translation of that experience, and as the saying goes, to translate is always to betray. At issue here is that the scientific interpretation of that data reduces this highly dynamic natural phenomenon which is both biological and metaphysical to a static number. However, a good translation draws on the unique tools of the new language to convey the intention of the original expression. If that is the case, then experimenting with the languages one uses to translate might be helpful. Given the depth and complexity presented by a data set of this nature, maybe including some bass with the bayesian statistics will help achieve Dr Carhart-Harris’ aim of presenting meaning in the data. Either way, it is a project that looks at nature through culture with an eye that has unusually dilated pupils.